I love how the Met is using items from their collection to create smaller accessible shows that, like their new digital initiative, Connections, creates cohesive themes from different time periods and objects. Last week when I went to the Met with my sister, we saw Thinking Outside the Box, one of these exhibits. It is totally enchanting and we oohed and aahed from one incredible piece to another. 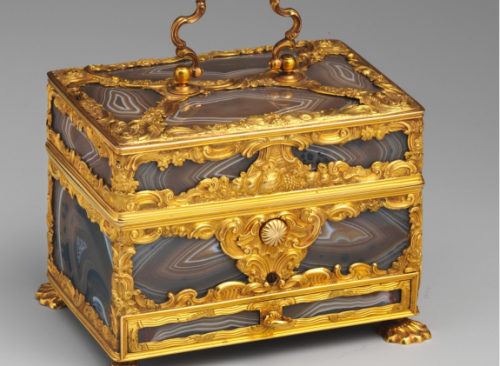 The exhibition includes one hundred boxes, chests and other small containers from the museum’s department of European Sculpture and Decorative Arts, many of which have not been on display for years. Dating from 1500 – 1900, not only are these pieces mini-masterpieces in their own right but they reflect so much about the life of the period – stylistically, historically and socially. 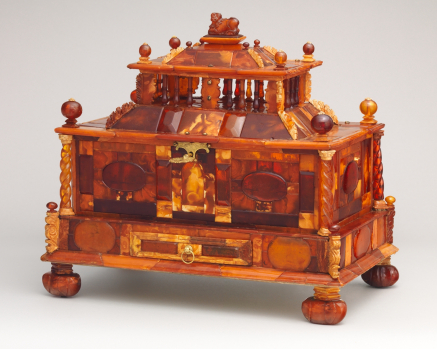 From travel cases to tea caddies to wonderful nécessaires, the objects represent the best of exquisite craftsmanship. They were both practical yet also collected as cherished works of art, made from all manners of material, often encrusted with gems and exotic components. 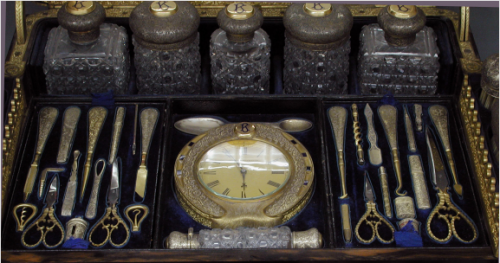 This incredible English toilet set from 1874-75 was one of my favorite pieces. 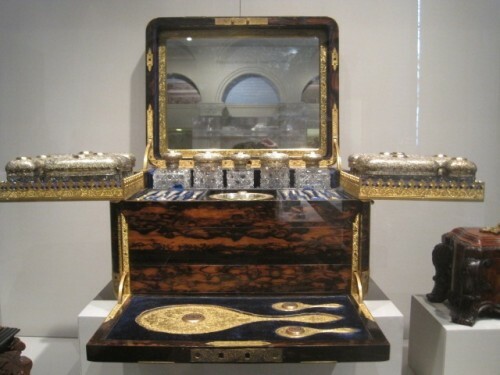 It is superbly made from Macassar ebony veneer on wood, with brass mounts, an interior lined with velvet, leather and silk, and implements of gilt silver, brass, cut glass, gold and enamel. 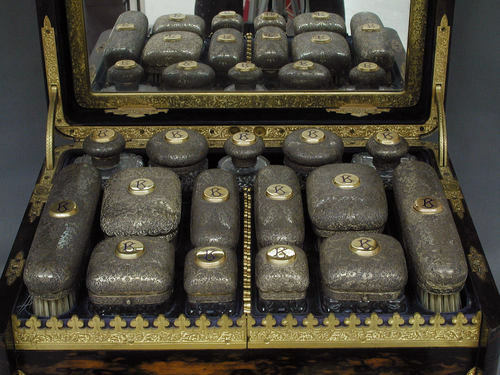 As railroads were built during the first half of the 19th century, train travel increased dramatically in England and on the continent, along with a desire for splendid dressing cases. 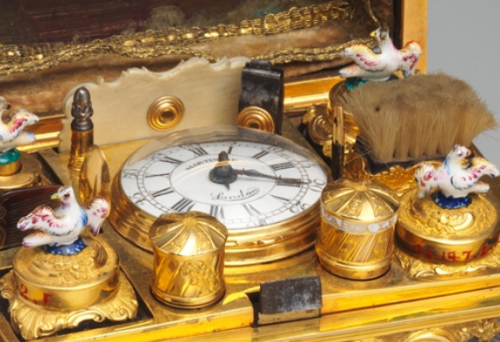 This magnificent case, containing a spectacular variety and number of accoutrements, is a perfect example. This speaks volumes about upper crust life in England at this time when elaborate dressing preparations were the norm. 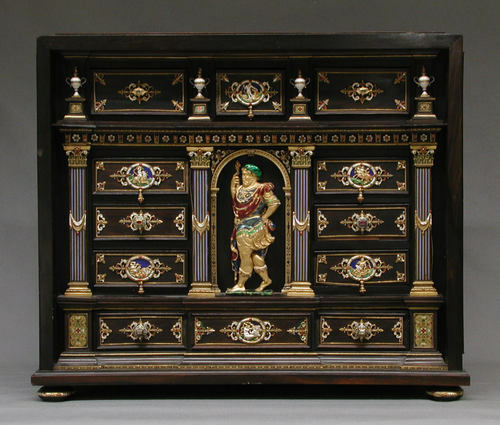 This custom of housing beauty necessities together started as early as ancient Egypt, leading to the design of chests specifically for that purpose. And although shapes and materials may have changed over the centuries, the concept stayed the same. Think of those elaborate Louis Vuitton or Goyard cases – the idea started here. The ritual of the toilette began in the 16th century and was a very serious affair. Take for example the top drawer of the same amazing set. In person it is resplendent with intricate details and elaborate workmanship. Customers were willing to spend fortunes commissioning these usable works of art. 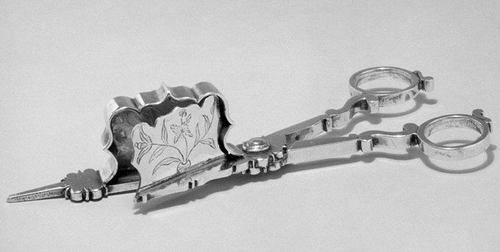 Here you can see the detail of the scroll work on the silver – just spectacular!! I can’t even imagine what many of these implements were for. 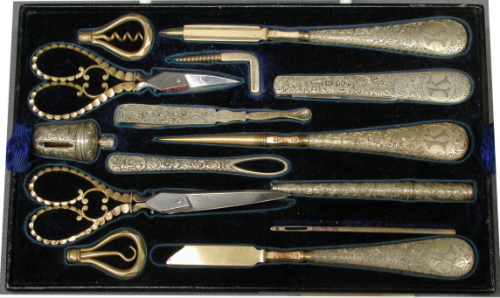 But the makers of this set could – don’t you just love the hand engraving? 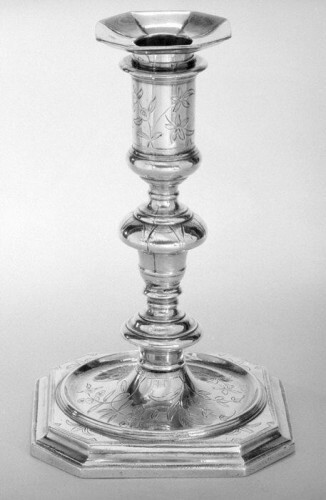 This luxurious silver toilet service is something a young 17th century upper class bride might have received as a wedding present from her parents or husband. The owner would have kept this in her bedroom or closet (really more of a sitting room). During this period, Chinese ornamentation was in vogue and the decorations of her closet would have reflected that with blue and white porcelain and other touches of the orient. 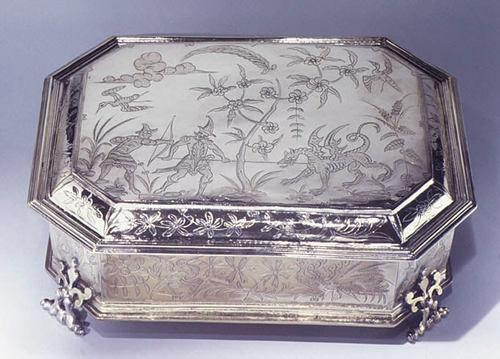 Made in 1683-84, the pieces have just such Chinese scenes chased on the silver, although the silversmith, William Fowle, probably just made the boxes and sent them to a specialist for the decorations. 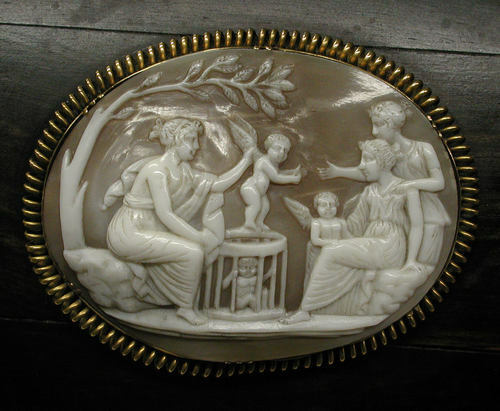 It’s amazing that these fanciful engravings look so contemporary in their decorative style. And don’t you love the incredible feet? 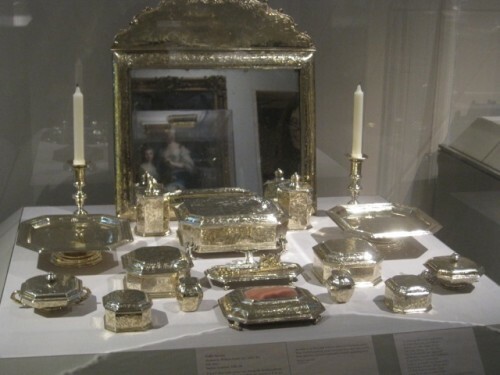 I adore silver and would just love to have such a set displayed on a dresser in my bedroom as a daily visual feast. Barely any surface was left untouched. Even the candlestick and snuffers were adorned. Another favorite was this amazing casket which was made in 1875 or 1876 for the famous R. & S. Garrard & Co., Crown Jewellers from 1843 until 2007. 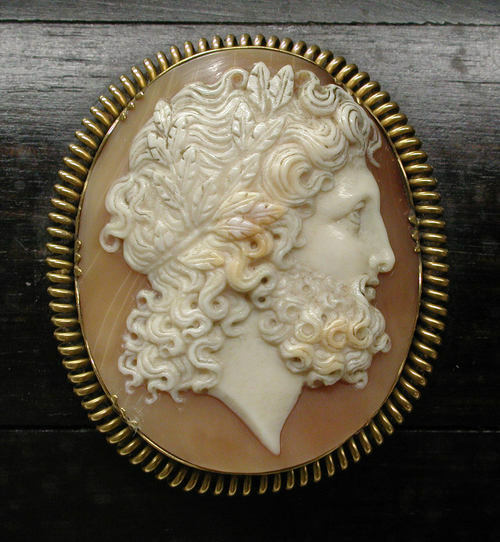 Donated by Mercedes Bass, this piece is made of Macassar ebony, silver-gilt and gorgeous shell cameos. Victorians, never known to skimp on the details, frequently bejeweled their possessions. Garrard must have ordered an enormous number of cameos from a Neopolitan workshop for this case. There is an exceptional range of images represented from ancient models to those based on the work of 19th century sculptors Canova and Thorvaldsen. And lastly is this exquisite jewel. 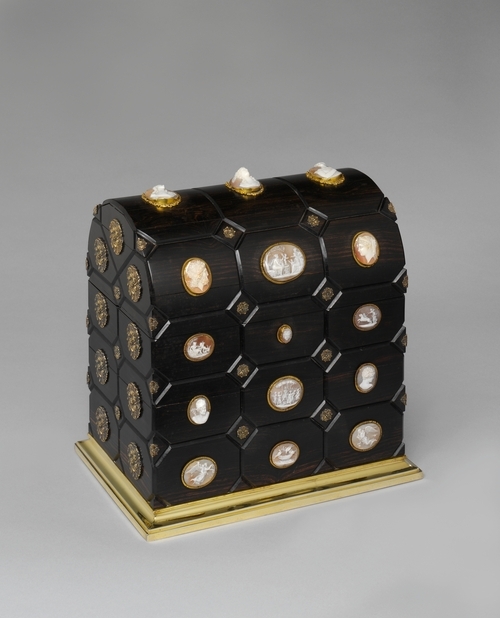 This nécessaire (a small decorative box used to carry “necessary” items) is English from the mid 18th century, made of agate and gold with a velvet lining. Fitted with a drawer below, it contains a variety of toilet, sewing and writing tools as well as a splendid watch. This exhibit was a total delight and so manageable in scale. If you are in the city and have a bit of free time, I highly recommend a visit to see this. It represents another era when the clock didn’t tick quite so quickly and beauty was considered essential to every day life. This entry posted in art, art history, history, learning. Entry Tags: Metropolitan Museum of Art, Thinking Outside The Box Bookmark the permalink. Terrific article. Interesting and well written. Thank you for sharing this wonderful exhibit. When the Met digs out more treasures from their archives, it is sure to be wonderful! I am a member there, and still don’t tire of their exhibitions: new or permanent. (I was proposed to in the Italian Sculpture Garden)! Wow, aren’t these absolutely incredible. Not the kind of thing you normally see in our throw-away culture. Looking at things like this – things that last – can be a real incentive to buy things that last….until I see that massive bargain!!! Waking up early this morning to finalize my packing for my weekend away. I wish my weekend away was to NYC (spent my college years in the city…and at the Met)! Alas, its only to Austin, TX for a government competition for my daughter. Wouldn’t it be nice to pack my things in some of these exquisite cases? Then I would need a beautiful leather bound decorated trunk to organize everything. Oh! and don’t forget the hat boxes! Thank you for such beautiful objects to admire. Now, I’m off! What a visually stunning exhibit. That silver collection is drool worthy! The detailing is remarkable. Thanks for the visual treat. I agree, I am off to someplace warm for 10 days, but this post made me think of several days at the Met instead. But only for a moment…couldn’t get in anyway. Enjoy the snow, it’s a record breaker! It’s so hard to choose which of these is my favorite. I’ll be visiting New York soon – I sure hope this wonderful exhibit is still being shown. Thanks for such a beautiful posting. Always love the Met and I am overdue for a visit – these are all beautiful examples of craftsmanship that we just don’t see today. I would love to have those scissors with the beaded handles. Spectacular! What a beautiful exhibition and such exquisite pieces of master craftsmanship. It is such a pleasure also to be able to enjoy seeing complete sets in good condition. 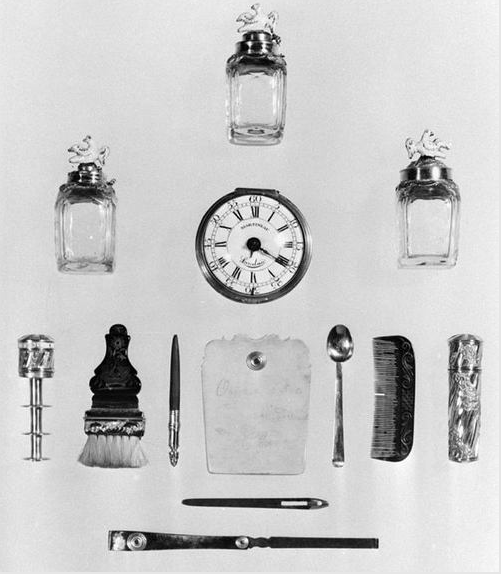 Can you imagine the lifestyles of these objects owners? My two favorites: English toilet set and the silver Chinoiserie decorated one. Thank you for sharing this jewel of an exhibit. perfect timing! i will be coming to ny for the gift show and allowed myself some time, exquisite, thank you! Oh my goodness, what a fantastic post! That last box is just breathtaking. Oh how I wish “necessary” objects were still made to be this beautiful! 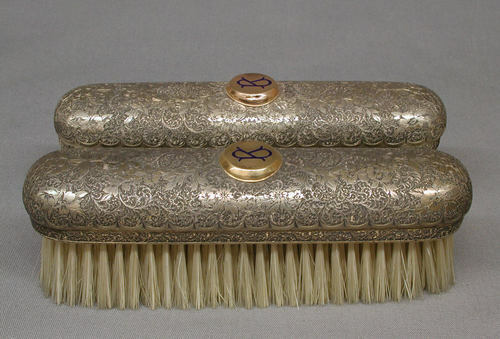 Could you imagine if we still carried toiletries and daily items in something this exquisite? What a dream! These images are breathtaking!!! Nothing is made to these standards that I have found. So much work and pride was taken in the detail in these items. Thank you for sharing. I am coming back and taking a longer look later. I am a silver lover, and I can’t get enough. ever since I was I child I have loved boxes and the small things that go in them… not a whole lot has changed… wonderful exhibit..awesome pics…. Love these pretty boxes and all that they contain… perhaps if I had one of the dressing boxes, I’d be able to leave the house more composed! 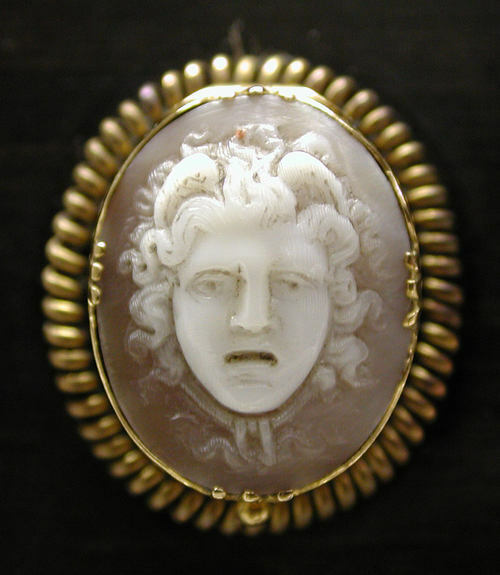 I just love the 17th-century silver pieces and the shell cameos! Just beautiful. Thank you for this snowy morning trip to the Met! Thanks for sharing a glimpse with us! What amazing pieces. It’s all so romantic, and the craftmanship required for one piece just boggles my assemblyline mind (damn you Ford…). Love the Cameos, have always had a “thing” for them. What an extraordinary collection… I love it ! Oh my goodness. Such refined elegant beauty. The craftsmanship, I don’t know what to say. I can imagine your delight as you spied each new piece. I’m also imagining the opulent surroundings of the owners, remarkable. The contents of some of these are little pieces of art themselves. Gorgeous, all of it! What a stunning exhibit..Thank you so much for sharing it with us:) Its so beautiful, elegant and the photos are truly incredible! Quintessence! I just kept chuckling this morning while packing my things for a weekend getaway. Looking at those beautiful travel boxes was so timely. 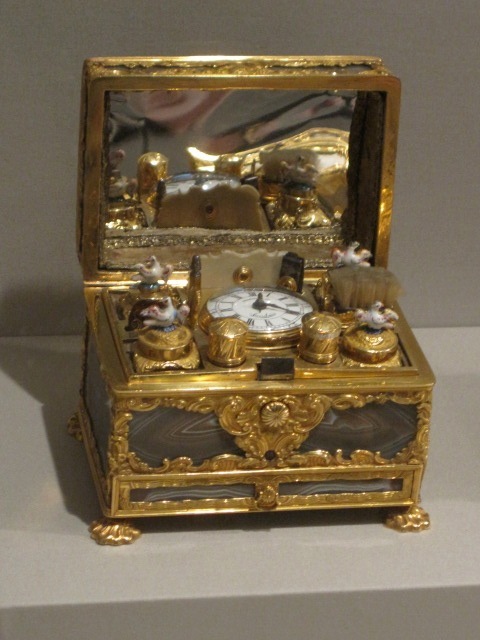 I wrote a little entry and included a photo of one of the “necessity” boxes in the exhibit at the MET. Thank you for posting on my blog. I feel like a bona fide blogger now because I consider your blog so professional looking! My kids think I’m getting crazier by the day. Amazing! That black box with the cameos! Gorgeous. Thank you for always making great posts! Lovely collection! I particularly like the box with the cameo. I would LOVE to see this! It so facinating the beauty and craftmanship that went into these designs, especially the toilette boxes. They all look like they were commisioned for royalty. I want one! My grandmother had a couple of goodies very similar to the beauties above. I was the careful child and was allowed to open and explore every little compartment. It was like disappearing into another world. I remember every little bit of it. Hoping someday they will come my way. You would appreciate my post, On Safari with Hermes. 81 queries in 0.553 seconds.